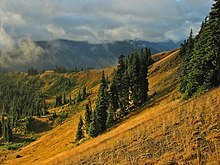 ↑ "Olympic National Park: Directions". National Park Service. Retrieved 2014-11-11. ↑ "The Economy of the Olympic Peninsula and Potential Impacts of the Draft Congressional Watershed Conservation Proposal" (PDF). Headwaters Economics (Bozeman, Montana). p. 6. Retrieved 2014-11-11. ↑ "Mountain Goats in Olympic National Park: Biology and Management of an Introduced Species". National Park Service. Retrieved January 8, 2014. ↑ Bolsinger, Charles L.; Waddell, Karen L. (1993). "Area of old-growth forests in California, Oregon, and Washington" (PDF). United States Forest Service, Pacific Northwest Research Station. Resource Bulletin PNW-RB-197. ↑ "Paradise Fire - Incident Overview". inciweb.nwcg.gov. Incident Information System - National Park Service. September 3, 2015. Retrieved October 23, 2017.